☆☆☆☆ “A new Hugo Blick drama is always an event. He is the finest auteur working in British television today and uses big dramas to tell intimate stories … Black Earth Rising saw Blick wading into yet more ethical quagmires: past and present relationships between Africa and the West, the workings of the International Criminal Court and the difficulties of prosecuting a man deemed a war criminal in one country and war hero in another.” — The Telegraph. ☆☆☆☆ “Blick’s Black Earth Rising takes on the 1994 Rwandan genocide. Black Earth Rising is a remarkable look at conflict of all kinds, prepared to suggest that people can do the right things for the wrong reasons, or do good and bad at different times. Grey areas, in high definition.” — Sunday Times. ☆☆☆☆ “What makes Black Earth Rising so brilliant is how it delves into knotty questions about the legacy of colonialism and reconciliation while still being engaging, pacy drama with complex characters. It’s no surprise that it’s the work of writer-director-producer Hugo Blick, the man behind The Honourable Woman, the 2014 Golden Globe-winning spy series.” — Evening Standard. ☆☆☆☆ “As much as it’s an examination of moral boundaries and international justice, it’s also a solid thriller, taking its time to lay the breadcrumbs of several mysteries amid a constant murmur of menace. It also looks fantastic … Black Earth Rising offers more than ratings-grabbing popcorn thrills. It flings an enormous cast of characters into a series of desperately combustible situations, and it demands that you keep up. It is, potentially, quite brilliant.” — The Guardian. ☆☆☆☆ “Squanders the audience’s goodwill with ill-conceived narrative turns, a reliance on cliché, and, worst, dialogue that defies belief. 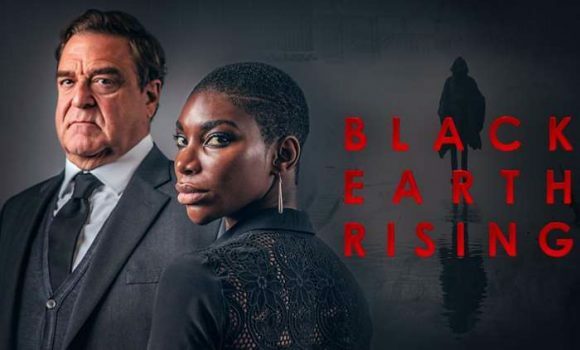 Its potential resonances as a story about how we metabolise, and prosecute, the worst of crimes ends up, soon enough, squandered as the audience loses faith in the story and its telling … Which raises questions about why Black Earth Rising exists at all, so inept is it at conveying the struggle at its centre.” — Variety.